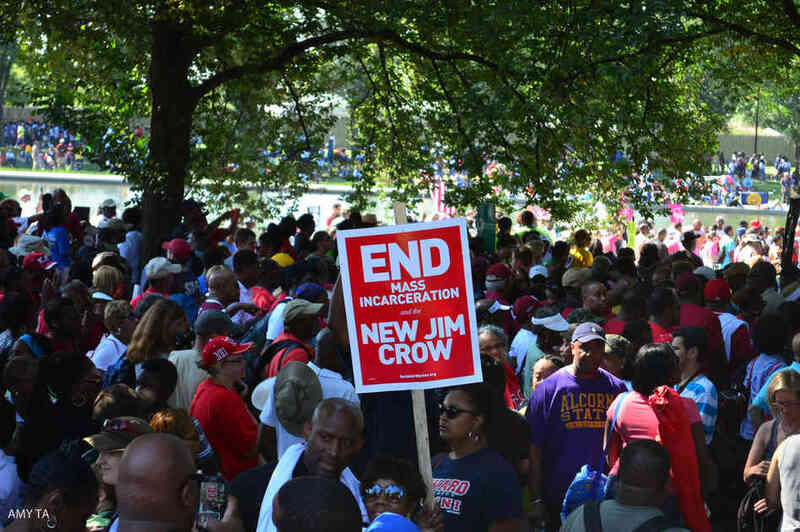 The main speakers at the march, however, did not match the politics and urgency of those who gathered in the Saturday heat. Even more frustrating is that few tried. I expect to get all kinds of hate mail for what I’m about to write, but not to write it would be an act of duplicity based on what I saw and what I heard. I saw the great Julian Bond get only two minutes to say his piece before being shuttled from the stage. I saw Reverend Jesse Jackson, who has done remarkable work in recent years against the banks and Chicago school closures, also get less time than a pop song. I saw Reverend Lennox Yearwood, who is doing some of the most important work in the country connecting climate change to racism, get ninety seconds before being cut off. There was one speaker at the 8 am pre-rally who said the word “drones,” and that was it for any discussion of US foreign policy. Based upon the speeches during the main portion of today’s events there can be little doubt that the Dr. King who was murdered in Memphis in 1968 would not have been allowed to speak at this fiftieth-anniversary commemoration of his life. There was no discussion of the “evil triplets.” Instead, we had far too many speakers pay homage to the narrowest possible liberal agenda in broad abstractions with none of the searing material truths that make Dr. King’s speeches so bracing even today. As Representative Nancy Pelosi spoke, it was difficult to not think of her defense of the NSA spying program or her vote against cutting funding to stop the mass monitoring of phone calls. As Attorney General Eric Holder, the person who is not bringing federal civil rights charges against George Zimmerman, was allotted 30 minutes—fifteen times that of Julian Bond—to speak from the front stage, it was difficult to not think about the fact that it has taken five years for him to say anything about mass incarceration in this country. The late Bayard Rustin insisted, as the lead organizer of the 1963 March on Washington, that no politicians or political appointees be allowed to speak. Clearly, there were different principles at work today. Yes it was profoundly moving to see Representative John Lewis, the only living speaker from the 1963 March on Washington. Yes, it was right on time for the march organizers to give the incredible Sybrina Fulton, the mother of Trayvon Martin, time to speak - albeit far too briefly. But the closest thing to an administration critic was 9-year-old Asean Johnson, who has been on the front lines fighting school closures in Chicago, bringing the fire to both President Obama’s confidante Mayor Rahm Emmanuel and the education agenda of Arne Duncan. I love Asean Johnson, but given the problems we face, far more was needed. I have never seen free placards confiscated at a national gathering by DC police. Then again, I’ve also never seen a demonstration so thickly monitored, with park police, the Department of Homeland Security and the military on every corner. Today, those “triplets of evil” King warned us about 1967 still strangle this country. 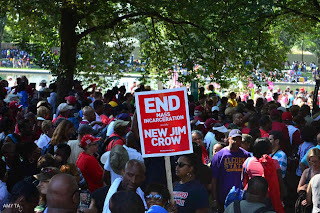 If we are not talking about the New Jim Crow, Wall Street and militarism, then what are we doing? King said, “If an American is concerned only about his nation, he will not be concerned about the peoples of Asia, Africa, or South America. Is this not why nations engage in the madness of war without the slightest sense of penitence? Is this not why the murder of a citizen of your own nation is a crime, but the murder of citizens of another nation in war is an act of heroic virtue?” Given US foreign policy, how can one say that they stand in King’s legacy and not raise these issues? I would ask those who find this objectionable to ask themselves, “What would Dr. King/Ella Baker/Fannie Lou Hamer/Malcolm X think about today’s march?” I don’t presume to know the answer to that question, but I know that we only honor their memory by asking it. > The article above was written by socialist sports writer, Dave Zirin, and is reprinted from the Nation.